Italy is set for their quest to conquer a spot in the UEFA EURO 2020. Italy defeating Liechtenstein on Tuesday 26 March 2019 at the Ennio Tardini Stadium in Parma, Italy. The match is for the Qualifying round – Group J. Surely, Italy living a great moment reaching 6 points and a positive goal difference of +8. It is also a historic game for forward Fabio Quagliarella becoming Italy’s all-time oldest goalscorer, at the age of 36 years and 54 days to score in the Italian team. A plus also is for young Moise Kean youngest player (19 years old) scoring for Italy in two consecutive games. Way to go and Italy is just rocking. In the 32nd minute, he goal by forward Marco Verratti with a right footed shot in the bottom right corner. Amazing! You bet Coach Roberto Mancini must be delighted to see the youngsters in action! Oops! Referee Kirill Levnikov gives a penalty to Italy conceded by Daniel Kaufmann following a handball inside the penalty area. Kaufmann also gets a red card leaving the team with 10 players for violent conduct. It is great Fabio Quagliarella to take the responsibility and not missing it! Yep! Quagliarella converting the penalty with a right footed shot leaving no hope for Liechtenstein goalkeeper!!!! Let’s party!!!!!! It is again the great youngster 36-years old Fabio Quagliarella converting another penalty and the score is 4-0. Yep, my friends, Quagliarella defeats goalkeeper with a right footed shot and the party is on with players and fans celebrating. Young at heart!!! oh yeahhh! Italy 4 – 0 Liechtenstein, 45th minute (3) before ending the first half FABIO QUAGLIARELLA converts another penalty with a right footed shot and the PARTY IS ON, ITALIA, ITALIA ITALIA gooooo QUA QUA QUA QUAGLIARELLA!!! What a super goal. It is a combo goal with the action seeing Quagliarella making the headed assist finding Moise Kean ready to just score with a headed shot!!!!!! What a momnet! Spectacular! 69′ #KEAN GETS IN ON THE ACT! Just a magic moment for Leonardo Pavoletti! Pavoletti substituted Fabio Quagliarella in the 72nd minute and scores in the 76th minute! Are you kidding me!!!! Pavoeletti defeats goalkeeper with a headed shot in the bottom right corner. The assist is by Gianluca Mancini. ITALY (4-3-3): Sirigu; Spinazzola, Bonucci, Romagnoli, Mancini; Verratti, Jorginho, Sensi; Kean, Quagliarella, Politano. LIECHTENSTEIN (4-4-2): B.Büchel; Wolfinger, Kaufmann, Hofer, Goppel; Kuhne, S.Wieser, Polverino, Sele Haseler, Salanovic. Just over an hour to go until 🇮🇹🇱🇮 #ItalyLiechtenstein kicks off at the Tardini 🏟️ in #Parma! Subs: Donnarumma Cragno, Biraghi Pezzella, Pavoletti, Grifo, Chiellini, Barella, Bernardeschi, Immobile, Zaniolo. Subs: Hobi, Majer, Brandle, Malin, Ospelt, Sele, Kuhne, Meier, Yildiz, Eberle, Frick, Buchel, Gubser. 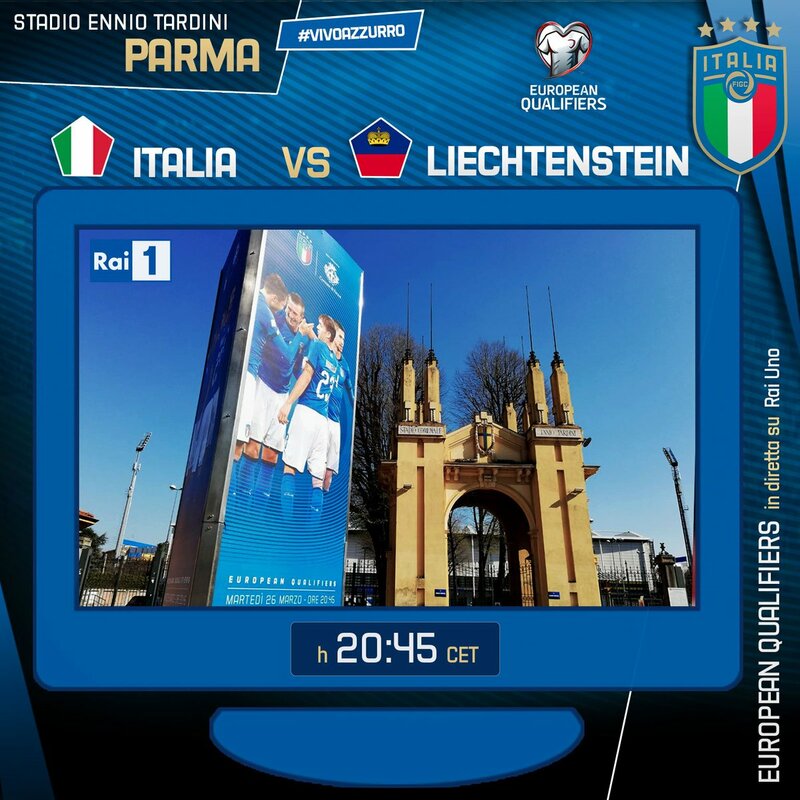 Here are the official starting lineups – formations for the European Qualification game Italy vs Liechtenstein on Tuesday 26 March 2019 at the Ennio Tardini Stadium in Parma, Italy at 20:45. The match is for the Qualifying round – Group J. It is Referee Kirill Levnikov from Russia to direct the game. Referee Levnikov will be assisted by Dmitri Mosyakin (RUS) and Aleksei Vorontsov (RUS). The fourth official will be Vladimir Moskalev (RUS). UEFA announcing the match officials for the European Qualification game Italy vs Liechtenstein on Tuesday 26 March 2019 at the Ennio Tardini Stadium in Parma, Italy at 20:45. The match is for the Qualifying round – Group J. It is Referee Kirill Levnikov from Russia to direct the game. Here are ITALY vs FINLAND official starting lineups – formations for the European Qualification on Saturday 23 March 2019 at the Friuli Stadium in Udine, Italy at 20:45. The match is for the Qualifying round – Group J. It is Referee Orel Grinfeld from Israel to direct the game.